Why have a San Diego Wedding? A San Diego wedding. Sunny, blue, breezy, and romantic almost 12 months per year. What better locale for a wedding than San Diego, that metropolitan yet laid-back Southern Calilfornia city? With its year-round warm climate and scenic environs, a San Diego wedding is ideal for both marrying couples and their wedding guests, who sneak a few vacation days surrounding your big day. Nothing is more welcome especially to snow-weary East-coast and Midwestern guests—than the sun, fun, and celebration of a San Diego wedding invitation. Adding to the fun is the multitude of options available to couples planning a San Diego wedding. From Oceanside in the north and Chula Vista in the south, blue water is everywhere, with many beautiful hotels, restaurants, and public parks lining Mission and San Diego Bays and the Pacific Ocean. Popular seaside San Diego wedding sites include Coronado’s world-famous Hotel del Coronado and La Jolla’s Cuvier Park/Cove and “pink jewel” La Valencia Hotel – all offering unparallelled coastline (and sunset) views. Bayside, carefree and picturesque San Diego wedding locations include the Catamaran Resort, the Bahia Hotel, and the Dana Inn, where calm blue waves and brightly-colored sailboats are poised to frame San Diego wedding photos. Happily, to carry though the shoreside mood, beach-themed San Diego wedding accessories abound. 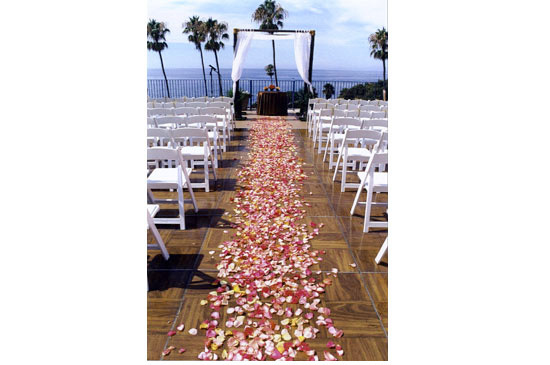 Everything from San Diego wedding palm tree candle wedding favors and rhinestone flower bouquet jewelry in the shape of flipflops—and of course, many seashell-bedecked accessories from guest books to picture frames– are available 24/7 for online orderinng. Myweddingaccessories.com, headquartered in San Diego, offers the widest online selection of San Diego wedding and beach-themed wedding accessories. So get ready. Pack those sunglasses and suntan lotion with your bridal gown and tropical-print cummerbund and head to points southwest for your unforgettable San Diego wedding.